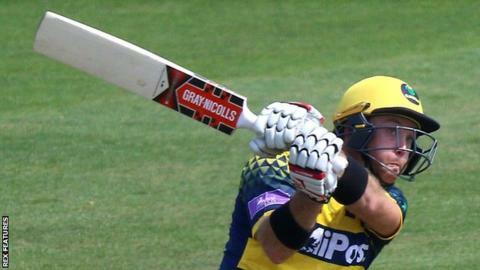 Colin Ingram struck a career-best 142 to help Glamorgan beat Essex by one run in a dramatic One-Day Cup match. Ingram hit eight sixes and six fours in his 130-ball innings with William Bragg (59) to help the hosts reach 281-7. Varun Chopra's controlled 124 in a 108-run partnership with Ravi Bopara (56) had Essex in control at 239-5, but Craig Meschede took 2-53 to fight back. Michael Hogan (2-42) then defended seven in a dramatic final over to give Glamorgan a second win of the season. Earlier Neil Wagner (4-58) had dismissed Glamorgan openers Jacques Rudolph and David Lloyd for single figures, but Bragg and Ingram rebuilt well in the middle overs before the South African cut loose to record his best List A score and boost the total. In reply Essex made a terrible start to their innings, losing Nick Browne and Tom Westley inside the first two overs before Alastair Cook (37) steadied things and Chopra and Bopara came together. They appeared to be in control but Bopara was run out at the non-striker's end by Meschede, who then clean bowled Chopra to leave a nervy run-in, which proved too much for Essex's lower order. Adam Wheater (14), Ashar Zaidi (14) and Ryan ten Doeschate all fell, leaving Simon Harmer and Neil Wagner to chase seven runs off Hogan's last over, but two byes off the final ball left them just two runs short of completing a fourth straight One-Day Cup win. "It was exciting for everyone but I was happy the boys stayed in the contest until the end. I've got a bit of history with the last over but it was one of those where you've got nothing to lose. "I actually thought they needed three to win (off the last ball) so I was thinking it's a tie, a bit deflated and everyone started cheering, they'd needed a boundary. "Colin hit some big balls, we needed Colin or someone to hit long at the back end and when he's in, there's no better player- he's one of the best white-ball players I've seen." "We are disappointed, we did enough and we were well placed to win it but unfortunately I guess no-one took responsibility for the last ten overs and they kept going, they bowled really well and it's definitely one that got away from us. "Things like that (Ravi Bopara's freak run-out) happen in cricket but we had stages to kill it off, our last ten overs weren't great but we've got three wins, our first loss so it's important we bounce back on Wednesday (against Sussex). "Cooky played nicely the other end, Ravi played really well to give us some impetus and we were well in control of the run-rate, but unfortunately it wasn't to be."